CHICAGO — Laundry/linen service operations have to stretch every dollar as far as possible. Labor, textiles, utilities—plants are saving money everywhere they can, without sacrificing quality. Equipment like washer-extractors and dryers may not seem to be an area where operators can save money on the purchase, and maintain quality, but there is an option: remanufactured equipment. American Laundry News communicated with representatives from three companies that offer remanufactured equipment and programs to learn more about this option—Joe Gudenburr, president of G.A. Braun in Syracuse, N.Y.; Gabriel Camacho, president of Consolidated Laundry Machinery (CLM) in Pomona, Calif.; and Keith Ware, vice president of sales for Lavatec Laundry Technology Inc. in Beacon Falls, Conn.
Q. Why does your company offer a remanufactured program/service? Gudenburr: This program was born out of our relationships with our many client partners. We saw that as we replaced equipment that our product is so durable that it structurally still had a great deal of life left in it but required updates to align with the advancements in technology, and to address those areas on a machine that wear over time. We found that our clients have needs, but not an endless checkbook that they can simply always go and buy new. The light bulb went off, and we developed the remanufactured program. This program affords our clients exceptional value while presenting an extremely green alternative in the industrial equipment space. At Braun, we have branded our Certified Remanufactured Equipment with a new logo and program description. We felt that it was very important that the market, and our valued clients, clearly understood that Braun is the only company that is certified to manufacture its products. Too often we find clients who buy our products from used equipment resellers that claim that they have remanufactured these items. 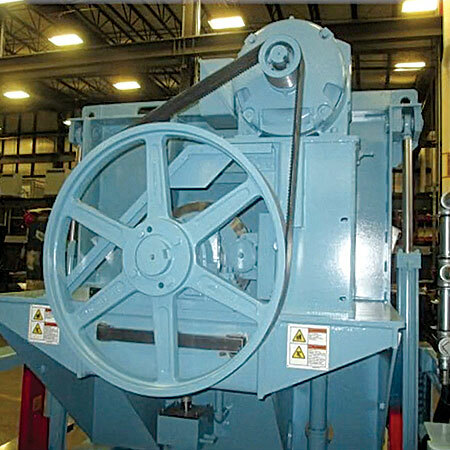 The reality is that these machines are at best reconditioned, and often are modified from our OEM specifications resulting in unsupportable units. In our case, remanufactured means that we bring a machine back to our facility after we have evaluated it in the field and determined that it is a suitable candidate for this process. We then strip the machine to bare metal, inspect all structural aspects associated with the machine, and then start the process of repair and rebuilding. As we rebuild the machine, we bring it to a current-day state and then sell the machine with a new machine warranty. Ware: Lavatec offers remanufactured machines for clients who want our equipment and its durability, but do not have the capital to purchase a new piece of equipment. At times, we also have offered trade-in value on a used piece of Lavatec equipment as part of a new equipment purchase. Lavatec then remanufactures the trade-in and sells it to interested customers. We have customers who send us their equipment for remanufacturing, believing the equipment has more useful life but needs updating. We also have converted many older, hydraulic drive machines from the early 1980s and 1990s to AC inverter drive units as part of this process. 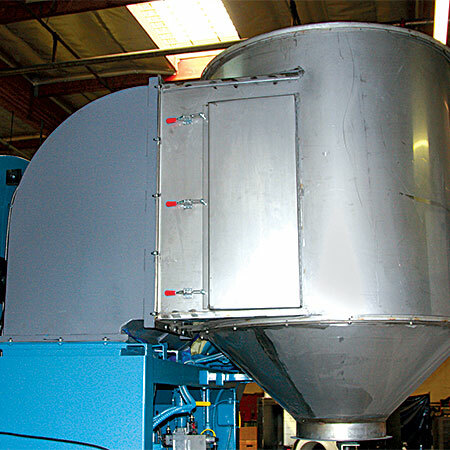 Camacho: Consolidated Laundry Machinery upgrades older CLM dryers because they possess a “work-horse” structure built to last—it never becomes obsolete. Upgrading provides an economical option for our customers. On-site refurbishment includes a PLC upgrade, along with replacement of wheels, belts and all pneumatic and electrical components. Factory remanufacturing provides all of the on-site work, but includes a complete teardown, clean-up, repair and repaint of structures. Plus, the dryer basket is removed and the old periphery is removed and replaced with removable panels. The basket itself is lathed so the rings run concentrically within the basket. Q. What are the benefits of remanufactured equipment to laundry operations? Ware: Added life on their capital expense and a lower cost option than buying new, if the equipment has the capability to be remanufactured. This is often done on washer-extractors and presses but rarely with dryers; the cost of remanufacturing and the benefits of extending the life are usually not cost effective. Camacho: CLM upgrades add as much as 10 years to the service life of the machine. They also improve the overall performance, ease of use and safety. Q. How does it benefit your company? Wouldn’t you rather sell a new equipment? Gudenburr: We are not a transactional company who simply looks to move volume. We are a consultative solutions provider, and our goal is to provide our valued clients with solution alternatives that best support their short- and long-term business needs. Ware: This is an added service that we offer existing Lavatec customers. We would always prefer to sell new equipment, but we provide this service when necessary. If every laundry was cash rich, this would probably not be a viable alternative. However, we realize some clients need to further extend the life of their equipment, so we offer this option as a partner solution. Camacho: There are some customers who do not purchase new equipment, including many good CLM customers. The benefit to CLM is that we are able to keep these important customers instead of losing them to a used dryer purchase. Q. Does remanufactured equipment come with any warranties? Ware: It depends on the level of remanufacturing the equipment. Warranties usually are provided only on the parts that were exchanged during the process. Camacho: The CLM dryer factory remanufacture comes with a full new machine warranty. Q. How does the life/value of remanufactured equipment compare to new? Gudenburr: The machines that we rebuild typically afford our clients savings over new, and these same machines can be expected to last as long as a new machine. This allows our client partners to stretch their capital dollar a great deal further as they look at executing strategic growth and cost management initiatives. Ware: This is a variable that depends on the condition of the equipment and expected life cycle after remanufacturing. Lavatec normally inspects the equipment prior to beginning a remanufacturing process and will let the customer know if the equipment is a good candidate for this program. If the frame or structure is damaged, it will not be remanufactured due to cost. But, there are many times when a 20-year-old washer-extractor can get 10-15 years of additional life if the unit is in good shape and can be remanufactured. Q. What goes into the decision-making process to purchase this equipment? Gudenburr: First, we need to define the needs of the client. From there we can start to look at the various options between new and remanufactured solutions. We also want to understand the client’s budgetary situation so that we can work to stretch their dollar to achieve the greatest ROI. In some cases, the client may want a new “N2” designed washer-extractor from us as they have space limitations; in others, this may be a moot issue and the remanufactured unit makes best sense. Every client and location’s circumstances can be unique, so we like to have this joint working session to make certain we support their needs. The second thing we have to understand is if we have a used machine in inventory or in the client’s inventory that is available for remanufacturing. Typically, we have some units in stock, but because of the process we use and the experience our clients have had, the inventory typically does not last very long. Ware: It is usually a cost-versus-reward decision. If a machine has been well maintained but needs upgraded components, motors and a drum, but the body and frame is in good shape, this process can be cost effective. However, if the machine is in poor condition with cracks in its frame or washer body, it may not pay since the cost of rehabbing it could approach the cost of a new machine. If the cost for renovation exceeds 60-65% of what it would cost for a new machine, it is often a better decision to go with the new one. Camacho: New CLM dryers incorporate the most sophisticated technology on the market. With our advanced controls and state-of-the-art heating system, they give CLM customers the best productivity and efficiency possible. The decision to purchase new or remanufactured is typically economical. Our upgrade options push older models toward the high-end without the cost of a new purchase. Check back Thursday for an American Laundry News web exclusive as an operator discusses remanufactured equipment, focusing on washer-extractors.